That's how painter Edvard Munch described the dread-filled scene that led him to paint "The Scream" in 1910. As Dr. Noelle Paulson notes over at Smarthistory, except for da Vinci’s Mona Lisa, Munch’s painting "may be the most iconic human figure in the history of Western art. Its androgynous, skull-shaped head, elongated hands, wide eyes, flaring nostrils and ovoid mouth have been engrained in our collective cultural consciousness." "The Scream" might also be one of the more fetishized and commodified paintings we've seen to date. These days, you'll find "The Scream" on t-shirts, jigsaw puzzles, and non-slip jar grippers. And, thanks to a Japanese company called Good Smile, you can now buy The Scream Action figure. It has posable joints, allowing you to put the figure into different poses (witness above). Or you can stand it alongside the other art history figures in Good Smile's collection--da Vinci's Vitruvian Man, Rodin's The Thinker, and The Venus de Milo. Oh, the fun you could have this weekend. 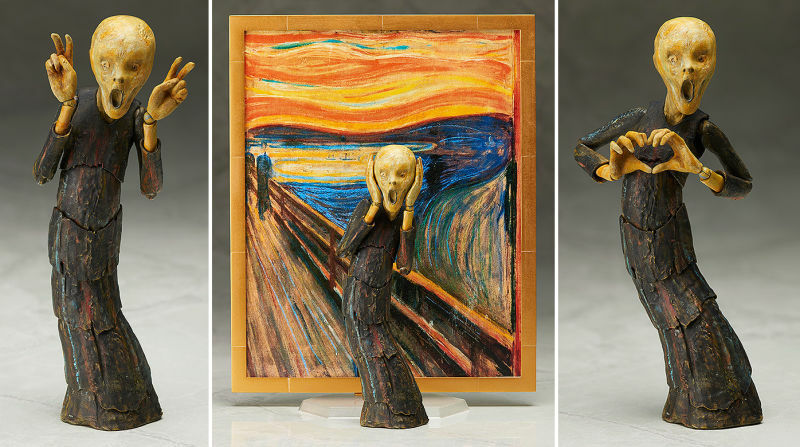 How do I buy The Edvard Munch Scream Action Figure?? ?